Le regroupement de la technologie et de la créativité fait de Cubase la station de travail audio-numérique la plus musicale jamais développée par Steinberg. 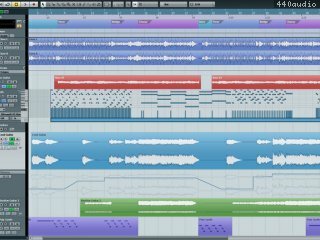 Reposant sur cinq éléments clés de la production musicale comprenant des nouvelles fonctions sensationnelles auxquels s'ajoutent une pléthore d'améliorations additionnelles, Cubase détient une foule d'innovations et de solutions améliorées qui repousse les limites de cotre créativité. The option “Automation Follows Events” now takes trimming of events into account. Additionally it reduces the amount of redundant automation points when moving events with this option enabled. Editing automation points or inaccurate writing of automation data can result in situations where the values briefly return to their initial value, visible as spikes in the automation curve or as jumping faders. In the Automation Settings, you can set a Spike Detection Range from 0 to 200 ms to adjust the detection window in which these spikes are found and treated by Cubase (Cubase Pro only). When working with Chord Pads, you can now set up MIDI or instrument tracks to use “No Player”. This passes unchanged through MIDI data from your remote keyboard, which is useful for all tracks not suited to play chords at all (such as drum tracks). You no longer need to explicitly disable or close the Chord Pads in such cases. The Chord Assistant window now gives a hint when no chord has been referenced in order to get suggestions for other chords. The “Link Groups Settings” window now includes the option to have the channel selection as part of the link group (or not) which comes also very handy when working with VCA Faders (Cubase Artist / Pro only). You can determine the view of external projects when you open them in Cubase: In Preferences > General you have several options now for “Open Project in Last Used View” available to control the behavior (Cubase Artist / Pro only). MIDI Output for Host Recording: Groove Agent SE is now able to send MIDI to Cubase in order to record MIDI notes. Follow Host Transport: Activate “Follow Host Transport” and Groove Agent SE will start and stop with the transport in Cubase. Alternate Loop: Alternate loop and reverse alternate loop are now available as new loop modes in the Sample Editor. Live Mode on Dynamic FX: Compressor, Gate, Limiter and the Expander can know be switched into the low-latency mode. Pitchbend Support: Pitchbend is now available in the controller lane of the Pattern Editor. MIDI Channel for Pattern Pads: The Pattern Pads can be triggered using a dedicated MIDI channel. When removing selected tracks Cubase asks for confirmation in case there is still event data on the tracks (or in TrackVersions). From the File Menu you can now access “Save New Version” which was previously only available as a key command. In VST Expressions > Expressions Maps > Remote Settings you can define to use either “Key Switches” as before or the new “Program Change Messages” option (Cubase Pro only). When loading projects in Cubase the application will prevent the ASIO port setup contained in the project file to override the ports currently in use for the Control Room, External Instruments and External FX. You may want to check your Input/Output setup in the VST Connections window in case you have to deal with ports set to “Not Connected”. The Export Audio Mixdown windows now offers dedicated options in avoid file name conflicts. First and foremost: Cubase becomes Cubase Pro. The name change reflects the 25-year evolution of Steinberg’s advanced music production system and spearheads the Cubase range of DAWs. 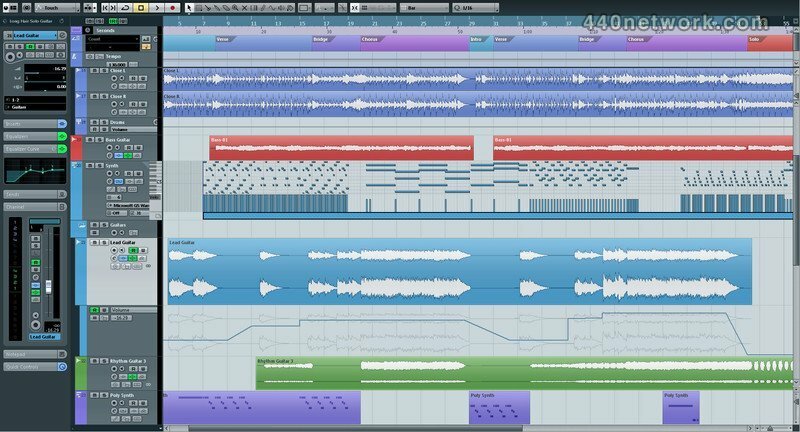 Both Cubase Pro 8 and Cubase Artist 8 witness a massive engine rebuild, which lets you run more instruments and more tracks. ASIO-Guard 2 is the magic word, improving the audio processing performance for instrument tracks and channels. Automation enhancements are key to Cubase Pro 8, giving you VCA faders and virgin territories. Yes, and we’ve added render in-place to both versions for bouncing MIDI and audio parts in a really easy way. Chord pads, Chord Assistant modes and MIDI tempo detection are introduced to the creative feature set of both Pro and Artist, while the new Rack Zone provides a dedicated area for the MediaBay sound browser and VST Instrument Rack. The redesigned Track List and Inspector, the new plug-in manager, global workspaces plus improved windows handling on PCs make the lives of Cubase users that bit easier. Then there’s the rejuvenated Quadrafuzz multiband distortion plug-in, the new Virtual Bass Amp, Multiband Expander, Multiband Envelope Shaper and many other effects. Groove Agent SE 4 now includes an acoustic drum kit, the Acoustic Agent, with 20 drum style patterns. The MixConsole has also witnessed feature additions and there’s a new version of VST Connect for remote recording over the Web. Apart from the new features in these latest iterations, Cubase has always provided a comprehensive feature set, guiding you through all stages of the creative process. To get an overall impression of Cubase, its capabilities and line-up, we recommend visiting the Cubase product pages. The Cubase Pro 8 and Cubase Artist 8 full retail versions are available for pre-order from resellers and through the Steinberg Online Shop from December 3, 2014. Shipping begins on December 8, 2014. Various downloadable updates and upgrades are exclusively available through the Steinberg Online Shop from December 3, 2014. Those of you who have activated Cubase 7.5 and Cubase Artist 7.5 since October 15, 2014, are now eligible for a free, downloadable Grace Period update to version 8. This pre-release version offers improvements that we would like to make available to our customers as soon as possible. While preliminary testing carried out for this version indicates that it is stable and reliable, it has not gone through our full QA testing cycle. Therefore, please note that this pre-release version is not officially supported. Rewire x64 support Cubase now connects to ReWire client applications in a pure 64-bit environment under Windows and Mac OS X. * Existing installations will show the additional presets only if the factory presets are restored from within the Quantize Panel or if the "RAMPreset.xml" is deleted from Preferences. New synths on the block: While Padshop boasts granular synthesis and complex textures at its finest, Retrologue brings back the beautiful sound of analog circuitries and vintage warmth. 700 extraordinary presets are included to fuel your production. Supersonic sidekicks: Recreate the atmosphere of a live floor performance with DJ-EQ and morph seamlessly between the superior HALion 4 filter types with MorphFilter. Plus, VST Amp Rack 1.5 adds new stomp box effects and signature presets made by world-class guitarists. One step closer to perfection: The take-comping workflow has been improved to give you the results you want in a more intuitive and faster way. By fusing the hitpoint and AudioWarp systems, single audio loops or the entire arrangement can be non-destructively quantized and groove-locked with a single mouse click. Automation handles are now displayed independently from any zoom level as soon as the mouse cursor is placed over an automation lane. If automation handles are selected, handles on all other automation lanes are displayed as well. ID-Mix-VU to ensure seamless integration. Under Windows OS, Cubase 6.0.5 features further improved decoding performance for Motion JPEG OpenDML video in AVI containers as well as Photo JPEG material. Record: Recording MIDI in "merge" mode no longer creates additional MIDI parts instead of merging. MIDI: Reloading a previously saved project in Cubase Artist no longer disables the input transformer of MIDI Tracks. VST Bridge: VST 2 32-bit plug-ins in Cubase in 64-bit mode under Mac OS X Lion are now displayed properly. Plug-in: The range scale of the Micro Tuner MIDI plug-in now reflects +/-100 Cents accurately. Plug-in: When using HALion Sonic SE in GM mode and exporting MIDI tracks, the resulting Standard MIDI files include all program changes. When using the new-in-6.0.3 "Gridlines in front of parts/events" function, the performance of the User Interface does not diminish anymore. Event Handling Opacity is now also applied when you use the tool modifiers to slip-edit an event. When slip- editing, the event will now turn semi-transparent just like when dragging and moving it in 6.0.2. The actual event handling opacity can be adjusted freely in File > Preferences > Event Display > Event Handling Opacity from full to zero opacity. The default setting is a medium value. Please note that the setting was previously named "Drag Opacity" and has been renamed in this version. For further details, please have a look in the improvements section of the 6.0.1 release below. To further simplify editing and positioning of Audio Events and MIDI Parts, Cubase 6.0.3 introduces the ability to draw the Grid Lines of the Project window and the Audio Part Editor in front of them. A new setting in the Preferences > Event Display section called "Grid overlay intensity", controls the intensity with which the Grid Lines are laid over Events. The default is a subtle setting. Please note that there is no overlay on Audio Parts. Now it's possible to control the smallest track height where data and/or names should be displayed or hidden. The previous preference "Show Event Data on Small Track Heights" has been removed and replaced by two new settings, which can be found in the Preferences > Event Display section. Cubase 6.0.3 adds enhanced support for the Steinberg EuCon adapter, including Avid MC Pro remote control surface compatibility. Please note that the installation of the latest EuCon adapter is required. The update is released together with Cubase 6.0.3 and available as a separate download in the support section of the Steinberg website. Cubase 6.0.3 features improved playback performance of HD video formats in general. Single-threaded codecs (like Motion-JPEG, Photo-JPEG, and QuickTime DV) will benefit from the also new "Boost Video" option: if enabled, one CPU core is excluded from audio processing and reserved for video decoding and playback tasks, resulting in smoother performance. The "Boost Video" option can be found in the Device Setup > Video Player page. Please note that the Multi Processing option must also be activated in the Device Setup dialog > VST Audio System page. Activating "Boost Video" may reduce the audio performance by design in order to prioritize video tasks. To higher the level of compatibility when exchanging audio files with other products and to give more flexibility in general, creating split files from multi- channel files can now be named. For example, it's now possible to add suffixes like "_L" or "_R" to the corresponding channel. The naming options can be found in the "Split File Name Format" pop-up menu below the "Split multi- channel files" or the "Split channels" options in the Preferences dialog (Editing Audio page), the Import Options dialog, or the Export Audio Mixdown dialog. The MultibandCompressor plug-in now features a new efficient Live mode which reduces plug-in latency as well as load on the CPU. The Live mode can be enabled below the Output knob and is especially useful when working with low ASIO buffer sizes (128 samples or less). For achieving best audio quality in final mixing stage, the Live mode should be disabled. In case performance issues occur, increase the ASIO buffer size. now available in the MIDI Device Manager. Issues resolved in 6.0.3 The following table lists all issues that have been resolved in this version. Import and Export of MP3 files is available for Cubase 64-bit on Mac OS X. To make the difference between channel types in the mixer more obvious, the fader cap color of audio tracks has been changed to white and for group channels to blue. Content issues with missing audio data for HALion Sonic SE and LoopMash 2 in Cubase Artist 6 have been corrected. Potential mouse-click issues within Cubase when using some trackballs and related control software (for example, from Kensington) have been corrected. Stability using AudioWarp with élastique Pro algorithms has been improved. A warning message "invalid project" when saving a project after dragging and dropping MIDI files from BFD2 into the Cubase Project window has been corrected. Potential sound artefacts when using the MultiBandCompressor with small ASIO buffer sizes has been corrected. The user interface of the External FX panel has been redesigned and now displays the fader caps correctly. Potential MP3 decoding issues when encoding files with the LAME encoder have been corrected. An issue with misplaced automation tracks when closing and re-opening the same project has been corrected. other than 44.1 kHz has been corrected. Various potential part/event redraw (display) issues during editing operations in the Project window have been corrected. Steinberg today releases Cubase 6 and Cubase Artist 6 at the 2011 NAMM Show. The latest incarnation of the world's most popular music production system holds an array of sensational new tools, inspiring instruments and effects, and a groundbreaking approach to composing with MIDI and VST. Developing professional composing tools for more than 25 years, Steinberg once again breaks new ground with Cubase 6. The new VST Expression 2 feature set now includes Note Expression — a revolutionary composing tool that exceeds the limitations of the MIDI standard. In the audio domain, Cubase 6 introduces a comprehensive toolset for lightning-fast multitrack editing, including state-of-the-art transient and tempo detection, multitrack phase-stable audio quantization and drum replacement functions. The new take-comping system provides a fast and effective way to build the perfect take. Cubase 6 also comes with exciting new instruments and effect processors, including the VST Amp Rack guitar suite plug-in, HALion Sonic SE, a streamlined version of Steinberg's HALion Sonic VST workstation, and LoopMash 2, the second incarnation of our innovative beat-mangling tool. Featuring over 20 bug fixes and enhancements, this update addresses problems involving the VST Bridge, VariAudio and the MediaBay among others. This update went through Steinberg's entire quality assurance process, therefore we recommend this update when running Cubase 5 or Cubase Studio 5. The brand-new version delivers performance, automation and video enhancements, as well as refined beat tools and workflow improvements in key areas. Cubase 5.5 is more efficient thanks to its reworked audio engine that provides better low-latency performance on multiple core systems. The plug-ins REVerence* and LoopMash* now offer a better CPU efficiency and the VST Bridge technology not only works faster, but also features enhanced compatibility with the majority of bridged 32-bit VST2.4 plug-ins. The 5.5 update also speeds up mixing and video editing. The automation panel has been redesigned and is now equipped with additional automation functionality, while the convenient Quick Control system has been expanded. Cubase 5.5 comes with a new Open GL accelerated video engine with full HD support* and scalable performance. But that's not all. Beat production is getting even better with Cubase 5.5. The Sample Editor has witnessed massive refinements when it comes to working with slices and AudioWarp editing. New functions have also been added to the beat specialists LoopMash and Groove Agent ONE, the latter featuring 19 brand-new and exclusive vintage drum kits. There are further improvements such as the redesigned MediaBay, an overhauled scrubbing function and new channel batch export features. Version 5.1.1 is now compatible with Apple Mac OS X Snow Leopard (10.6) and Microsoft Windows 7. All Cubase retail versions now include a new Project Assistant. The "Save as Template…" window has been redesigned for tagging Project Templates with attributes. In the Browser section of the MediaBay, a new entry for Project Templates appears in the VST Sound node. Attributes of Project Templates can be modified there using the Tag Editor (Cubase only). A complete new set of Project Templates is included and replaces all previous factory templates. For further details working with the Project Assistant please consult the separately available "New Features"
The AmpSimulator plug-in has a new look and feel. All Jog/Scrub features known from Cubase 5 are now also available in Cubase Studio 5. The Jog/Scrub wheel can be invoked by activating it from the Transport Panel context menu. Related Key Commands can be assigned in the Transport section of the "Key Commmands" window. Jog/Scrub can be used from remote control devices. Fixed a problem with MediaBay previewer playing MIDI Loops from e.g. VST Sound Instrument Set "Synthesizers"
Integration of Yamaha Motif XS plug-in editor as External Instrument has been enhanced and allows usage without having an audio-connection of the device to your audio/computer hardware (e.g. Motif is only connected to the system by MIDI and not by FireWire). Instrument Channels will appear with a transparent fader cap in such cases. Steinberg CC121 AI knob can be used to control parameters of most VST2 plug-ins. Please note that this does not work with plug-ins with no mouse-wheel support implemented. Some plug-ins may require a click on the desired parameter first, instead of just hovering the mouse cursor over the parameter. The Lock button of CC121 is not supported for VST2 plug-ins. These restrictions do not apply to VST3 plug-ins. Support for software version 1.5 of MR816 hardware series and CC121 Advanced Integration Controller. 5.1 attributes will be written into the project file. Attributes are not lost when transferring project files from one system to another, allowing you to use the MediaBay to its full extent managing your project files. Presets can be now rated in "Browse Sounds..." or any other Preset Browser windows. it there, instead of always creating a new track. It is no longer needed to adjust the MIDI File Import Preferences for this workflow. the most suitable Input Bus found in the current VST Connection Input Bus setup. Plug-in scanning at program start-up has been optimized. In the Plug-in Information window, a button "Update Plug-in Information" has been added which enables scans through all installed plug-ins and adds additional information about plug-in properties to the list. In the Setup window of VST Expression, it is now possible to define up to two individual MIDI Control Change messages for a Sound Slot in the Output Mapping area. Each sound slot can be associated with a color. When working in the MIDI editors, such as the Key Editor, you can use the Color Scheme Selector in the Toolbar to colorize note events by Sound Slots. In LoopMash, saving or deleting a scene can be aborted by clicking the empty space next to the Scene Pads. An "Empty" preset has been added to easily clear an entire LoopMash instance. LoopMash now also supports the AI Knob of the Steinberg CC121 controller. Supports for the AI Knob of the Steinberg CC121 controller has also been added to Groove Agent ONE. The pads C1 – B4 also include additional automation parameters. The central display on the Play page now displays a polyphony counter. The ASIO load of REVerence has been drastically decreased and the plug-in latency has been reduced from 2,048 to 256 samples. Please note that CPU performance depends on the length of the impulse response and the number of channels used, which should be considered when setting the ASIO buffer size. Stability using AudioWarp with élastique Pro algorithms has been improved. vous avez probablement une petite inversion dans le prix: vous indiquez 500$ / 600€: je présume que cela devrait être l'inverse. (Tu peux effacer ce message après lecture et correction, si correction il y a lieu - sans quoi je vais recommander à tous les intéressés d'acheter Cubase en dollars).